If you’ve never been happy with your smile, you may have thought about cosmetic dentistry before, but maybe you’re not sure where to start or you feel it’s not within your budget. If your smile lacks the luster and perfection it once had, you may be thinking about cosmetic dentistry for the first time. The truth is, your smile is so much more than aesthetics. Yes, improving your teeth will make your smile and your overall appearance more attractive, but the consequences of these improvements are what makes our job exciting and rewarding. A simple cosmetic fix or a full smile makeover might just change your smile, your confidence, and your entire life. Schedule a consultation with Dr. Hahn today to get started! Veneers were originally crafted to improve movie stars’ smiles for the silver screen, but today they’re a wildly popular cosmetic solution for any and all smile woes. Veneers are thin shells of tooth-colored porcelain that are bonded to the visible surface of the teeth to improve their appearance. A single veneer can be applied to correct a lone problem tooth, or we can give you a full set (for all the front teeth) for a complete smile makeover—or anything in between! Veneers can correct teeth that are chipped, cracked, stained, or otherwise imperfect and transform them into the perfect pearly whites you’ve been dreaming of. Keeping in the theme of “our patients deserve the best”, we use the #1 patient-requested brand of veneers—Lumineers®. Lumineers are ultra-thin so they can be applied seamlessly over your natural teeth, with no shots and no drilling—which means a quick and painless experience. With the help of our advanced same-day technology, we can even complete the entire veneers process in a single visit! There’s no one on Earth that doesn’t appreciate a bright white smile. White teeth are a sign of youth, health, and vitality—plus they just look pretty! When your smile is the first thing others notice about you, you want it to send a message that portrays how you feel inside. Is your smile sending the message you want it to? Or is it giving away your lifelong love affair with coffee? Not to worry, because Dr. Hahn at Galleria Family Dental offers safe and effective professional whitening treatments. You may wonder why one would pay more for a professional whitening when there are hundreds of whitening products in stores and online. It’s sort of like coloring your hair or changing your own oil. Yes, you CAN do it yourself, but there are professionals for a reason, and it would be wise to leave it to them if you want the best results. At Galleria Family Dental, we offer take-home whitening kits, so you can get professional results from the comfort of home. So your smile isn’t perfect, but it doesn’t bother you enough to want to invest in any major cosmetic treatments like orthodontics or veneers. Maybe you have cracks, chips, gaps, minor alignment issues, or stains—or all of the above! Whether your issue is singular or plural, a simple bonding treatment might be just the solution. Bonding is both a restorative measure to strengthen and repair teeth, as well as a cosmetic one to cover stains, fill gaps, and improve the general shape and appearance of teeth. We use a tooth-colored resin to paint over the surface of the teeth to correct imperfections and put the finishing touches on your natural smile. 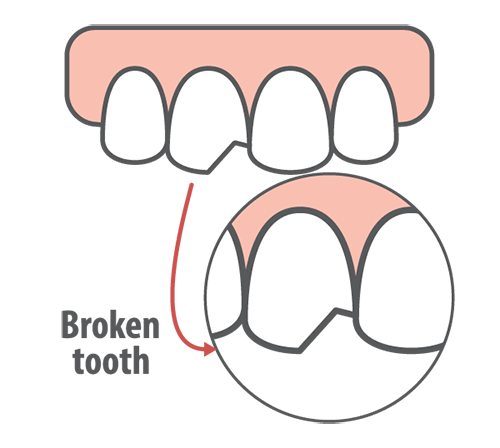 Bonding can accomplish many of the same goals as veneers, but without the major investment. Bonding is a simple and affordable treatment that we can complete in a single visit, and it might just change the way you feel about your smile! Most people don’t put too much thought into their gums, unless of course you’re going through gum disease treatment or have a gummy smile. A gummy smile is simply a smile that shows more of the gums than the teeth, or at least more gums than desirable. Thankfully, gum contouring can improve your tooth-to-gum ratio, even out your gum line, and allow those pearly whites to take center stage for a brighter, more beautiful smile. To perform gum contouring, first we use a topical anesthetic to numb the area and a painless injection to ensure your comfort. Then we use a soft tissue laser to gently trim and shape the gum tissue into the perfect shape for your smile. The laser is precision-accurate and seals the tissue, so you don’t experience any pain or bleeding and you can leave with a stunning smile the same day. If you’d like to learn more about cosmetic dentistry, or you’re ready to schedule a consultation with your Henderson cosmetic dentist, Dr. Hahn at Galleria Family Dental, give us a call today or request an appointment online! We look forward to partnering with you on your journey for health and wellness.